It was now time to enroll our children in CCD. When we called to register we found out that my oldest was now too old to be entered into the program. If he wanted to get confirmed he would have to go through the RCIA program instead. It was disappointing news at first but worked out better in the end. The middle two children were enrolled in CCD and began their religious education. Seeing RCIA is an adult formation program it wasn’t something I was going to force my son to go through. If he wanted to become Catholic we would enroll him in RCIA. If he didn’t or wasn’t ready we wouldn’t force him to go through it. My son aims to please everyone and said he wanted to go through the program. I hoped that he wanted to go through it for himself and not just to please me. He assured me that it was something he wanted to do. His mother wasn’t very happy with this decision but said she would support him in it. He chose his grandfather to be his sponsor. Much to my surprise when we enrolled my son my wife also enrolled. She had decided that she wanted to get baptized and become a full member of the Church. I could not be her sponsor because of our marriage situation but I attended classes with her and my son. Going through RCIA the second time was more difficult for me. I had learned more about my faith and was looking to receive a greater depth of instruction than what was taught. I had forgotten that RCIA was meant to be a taste of the faith, enough so the person could understand what they were committing to but not too much to be overwhelming. It was perfect for what my wife and son needed. RCIA in our new parish was taught by a team of seven people. Many of them have become dear friends. One has become my mentor. It was finally time for our family to right our relationship with God. I am sure it was with divine help all of the puzzle pieces started to fall into place. First – my annulment was granted. I was now free to marry. My wife’s first marriage was also reviewed and she was cleared to marry as well. Free to marry, we could have our marriage blessed and be viewed as husband and wife by the Church. Father Ariel Valencia witnessed our marriage in a private ceremony in the chapel of our church on March 16th, 2013. We had already done the big show wedding. This one was for our family and God. Next – I received the Sacrament of Reconciliation for the first time. This was something that was overlooked the first time I went through RCIA and my Lutheran baggage told me that this was something I didn’t really have to do. With that baggage gone and a deeper understanding of my faith I understood that this was a huge hurdle keeping me from God. One by one I went through the list of sins I had committed over the course of forty years. Some were extremely painful to say out loud. Some brought forth immense shame. Both of those were good things as it showed me that I was sorry for what I had done. Many people have told me about the weight they feel lifted off of them when they hear the words, “I absolve you of your sins.” I didn’t have that experience. It was good to know that I had been forgiven but at the same time some healed wounds leave scars and I have some that run very deep. In any event I was now a man with a clean slate and a blessed marriage. I was now in a right relationship to receive the Eucharist again. The thought of this brought me joy but that joy failed in comparison to what happened next. We were now entering Holy Week where the catechumens (unbaptized) and candidates (baptized adults seeking full confirmation) were preparing to become full members of the Church. On Easter Sunday, 2013 my wife and her two children were baptized. 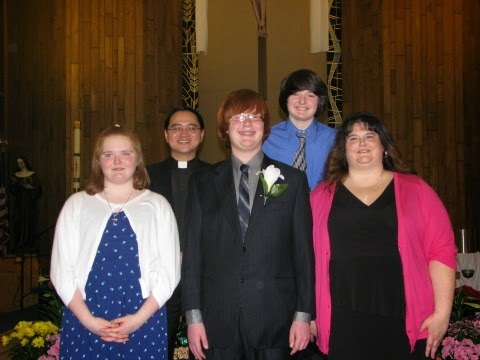 Then my wife and oldest son were confirmed and became full members of the Church. Next my wife, my oldest and I all received the Eucharist together. For me it was the first time receiving the Eucharist in thirteen years. One could argue that it actually the first time I received the Eucharist correctly. This by far was the greatest day of my life and the source of the greatest joy I have ever known. A husband and father’s primary responsibility is to make sure that his wife and children make it to heaven. When I first started down this road I had little hope of fulfilling that task. I am constantly amazed at what God can do if you only allow him to work through you. I now had a Catholic family, all baptized and growing in their faith. God was far from done. Father Ariel Valencia, my wife and children - Easter Sunday 2013.